Last week I attended a “think tank” conversation with leaders of the Rodham Institute, a newly established center at George Washington University that is dedicated to reducing health disparities in Washington, DC. This is an important effort, because Washington, DC is such a divided city. “East of the River”, Wards 7 and 8, are the poorest areas in the district, with some of the most challenging problems, and with an obesity rate of over 40 percent, more than the national average, and more than the extremely poor state of Mississippi. There are food deserts “east of the river” where it is easier to get potato chips than an apple or banana. While there are rudimentary hospitals and health centers, most referrals to a specialist will likely require a Ward 7 or 8 resident to take an expensive taxi ride across the river. This city is rife with health disparities. Washington, DC isn’t the only city with these issues. Whether you are in San Francisco, Baltimore, New York, Chicago, Atlanta, or Dallas, there are areas that can be described as predominately black and predominately poor. To be sure, there are well-off people in these predominately black areas. They live there by choice, and have the resources and luxury of mobility that gives them access to some of the best hospitals in the city. But the poor don’t, and when health centers consolidate or close, they experience barriers to health care. Health disparities are a function of assets, access and attitudes. Those with greater assets have more access to healthy food, better health care, and more information. Those without assets do not, and often make a decision to forego medical treatment in terms of something more basic – food. Some of these folks can’t or don’t know to go to cost-savings suburban stores like Costco, where bulk healthy food is readily available. Some, stuck in habit, prefer greasy food to baked options. Many do not make the connection between eating choices and heart disease. Assets and access are linked. Then there is the issue of attitudes. Too many physicians don’t take poor (and African American) patients seriously. The Institutes of Medicine released a study in 2002 that showed that African American and Latino men were less likely than others to get painkillers for a broken bone. A subsequent study showed that African American children were likely to get differential treatment in emergency rooms. Too many poor people use emergency rooms for primary health care because they lack health insurance or access to good health care. The attitude gap is also internal. Too many poor (and Black) people don’t take good care of themselves, which explains some health disparities. Frequent exercise and good eating habits go a long way toward healthy living, as do regular checkups. Some folks don’t know how to do the right thing. Some folks don’t have access to the right thing. And some people just won’t do the right thing. One of the ways the attitude gap could be bridged is by admitting more African Americans to medical school. However, one of the speakers at the Rodham Institute conference indicated that not one African American man was admitted to this year’s class at Howard University’s medical school! If historically black Howard University won’t admit African American men, who will? Former Secretary of State Hilary Rodham Clinton closed out the conference, graciously laying out her vision for the institute and answering questions. She said that health disparities are a function of inequality, and that’s the point that sticks. Too often we look at the results of inequality without looking at the causes. Health disparities, the achievement gap, unemployment differentials are all a function of inequality. Dealing with these gaps on a piecemeal basis doesn’t get us close to the solutions. At the same time, how do we close the income and wealth gaps that are at the root of so many other gaps? In the current conservative environment, talk of income or wealth transfers is just that. . .talk. Conversations about reparations are even more meaningless in this environment, especially when the entire Congressional Black Caucus won’t sign the Conyers bill on simply studying the impact of slavery on contemporary American life. The Rodham Institute has laudable goals, a wonderful founding director in Dr. Jehan El-Bayoumi (full disclosure – my doctor), and a great community focus. In working to eliminate health disparities, perhaps this group will get us a bit closer to closing economic disparities as well. 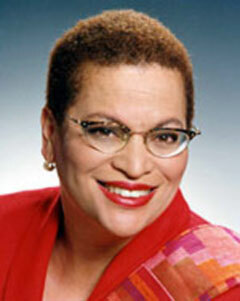 Julianne Malveaux is a DC based economist and writer and President Emerita of Bennett College for Women.